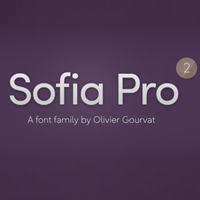 Sofia pro font was originally designed in the year 2008 by Olivier Gourvat. It offers an inkling of innovation, perfect synchronization and roundness. These nuances ensure Sofia pro a harmonious and sagacious appearance for both texts as well as headlines. The font was redesigned in the year 2012. One of the best things about this typeface is that it supports a huge range of languages with over 500 glyphs! The latest version has a lot more OpenType features such as small caps, case sensitive forms, contextual alternatives, fractions, stylistic, alternates, proportional and tabular figures. With 16 mesmerizing font options, Sofia is a perfect font family for brands creation, signage, text, print and even web design creation.